Are straw bale buildings safe from termites? Very few termites are likely to be interested in eating the straw bales themselves. Even those that normally eat grass. Lots of subterranean termites will happily travel through the bales to reach unprotected framing timbers (such as door frames and window lintels – see photo). You won’t sit the bales right on the soil anyway (moisture hazard) so all it takes is some attention to design to put a subterranean termite block in the foundation, just as you would with any other house design. If you’ve already built without considering, find a well-skilled termite manager to inspect and advise. Keep in mind that the biggest threat to straw bales (after moisture-caused decay) comes from rodents, especially mice. 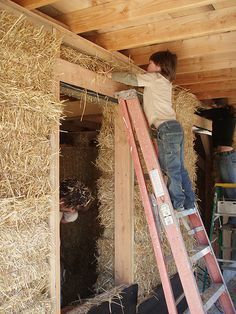 Bookmark this article Are straw bale buildings safe from termites?